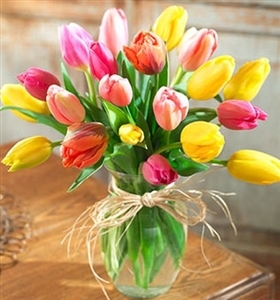 Our arrangement of 20 multi-colored tulips makes the perfect flower bouquet for birthdays, just becauses, anniversaries, or thinking of you gifts. Looking for something simpler? We also have a bouquet of red tulips available. Please feel free to contact us if you have any questions regarding our products, service, or flower delivery in San Diego! 20 multi color tulips simiplistically arranged in a vase.